The Algarve, which is known for its sandy beaches and golf courses, is one of Europe’s top vacation spots. File photo of forest fire in Portugal last month. PORTUGAL’S ALGARVE TOURIST region was the latest to be hit by violent forest fires, prompting the evacuation of a luxury hotel and three hamlets. Backed by water-dropping aircraft, over 2,700 firefighters were trying to bring under control some 100 blazes nationwide despite a respite from the intense heat which has gripped the country in recent days. The fire was very close, there was a lot of smoke, but the flames spared the hotel. Officials evacuated another 30 people from three nearby hamlets because of the blaze, which broke out in the wooded hills around the mountain town of Monchique and then moved south towards the coast. Vitor Vaz Pinto, head of emergency services there, said that after dying down, the fire had re-started on Wednesday evening “in an explosive manner”. “It’s hell,” a local resident said on Portuguese television. I don’t know if someone set fire to the area, or if the wind fanned the flames. In the north, meanwhile, a large-scale blaze was raging in the Douro International Natural Park, near Freixo de Espada a Cinta on the border with Spain. “We have had to evacuate a retirement home, the flames came very close,” said Joao Possacos, mayor of the affected village of Bruco. About 100 forest rangers protested in Lisbon to demand higher pay and more staff. “Three hundred and seventeen forest rangers are not enough to secure the security of Portugal’s forests,” said the head of their union, Luis Pesca. 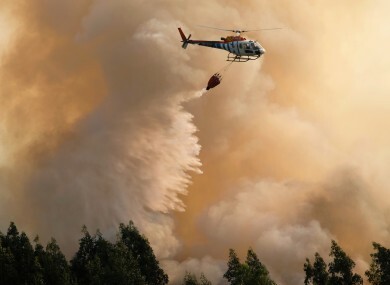 Across the border in Spain in the northwestern region of Galicia, firefighters and water-dropping aircraft continued to battle two major blazes in the province of Orense. The wildfires near the towns of Entrimo and Oimbra have been burning since Tuesday and they have so far ravaged around 5,000 hectares (12,000 acres) of land, the regional government of Galicia said in a statement. Other fires continued in the north and southwest of Spain. But Agriculture Minister Isabel Garcia Tejerina has played down the scale of the fires this year. According to her ministry, wildfires destroyed almost 40,000 hectares (100,000 acres) of land between January and August – an area close to the size of Barbados. But this is still far less than the average for the period, which since 2006 has been around 78,000 hectares. Many of the fires are suspected to be the work of arsonists. On Thursday, a man was arrested in a natural park in the southern Spanish region of Andalusia, suspected of having set paper and plastic bags on fire to try to spark a blaze near the small town of Almaden de la Plata. “He is a resident (in the area) and has confessed,” a spokesman for police in Andalusia told AFP. Email “Hotels evacuated as wildfires hit Portugal's tourist Algarve region”. Feedback on “Hotels evacuated as wildfires hit Portugal's tourist Algarve region”.